It’s taken a couple of tries, but I finally got got the caramel apple pie to come out perfectly and just in time for Thanksgiving. 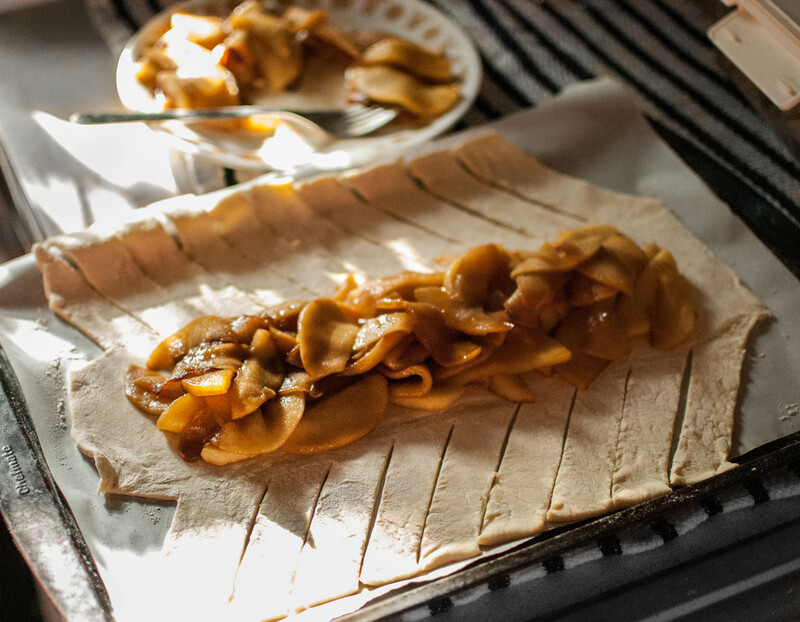 As I mentioned in my previous post, I first saw this recipe on Cup of Jo over the summer and set it aside for apple season. I found the recipe to be very inspiring, but a tiny bit sloppy. There were details missing that I found frustrating, particularly with the cider caramel, so I took the liberty of making a few changes, which I’ve outlined below. 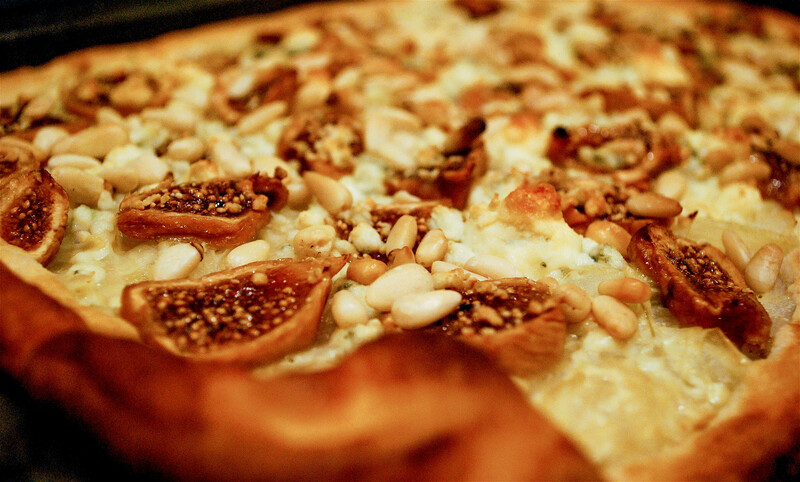 Given that the original recipe’s crust is from Martha Stewart, it’s probably perfect good to use. 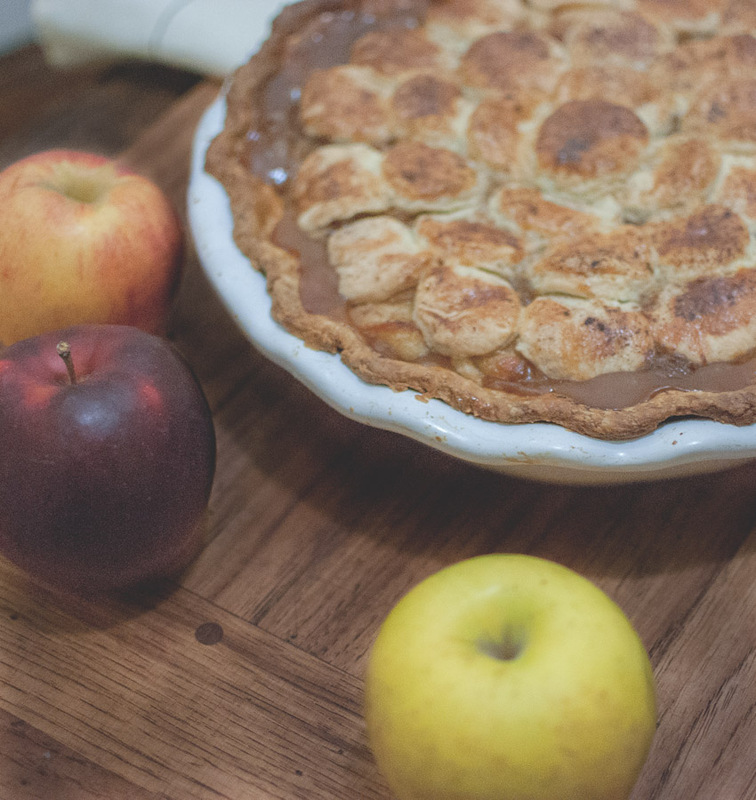 I however, have a lot of faith and experience with Mark Bittman’s flaky pie crust and made two of those for this pie. Bittman’s recipe is easy, always flaky, and has never gotten soggy on me. Getting the caramel right took a few tries. 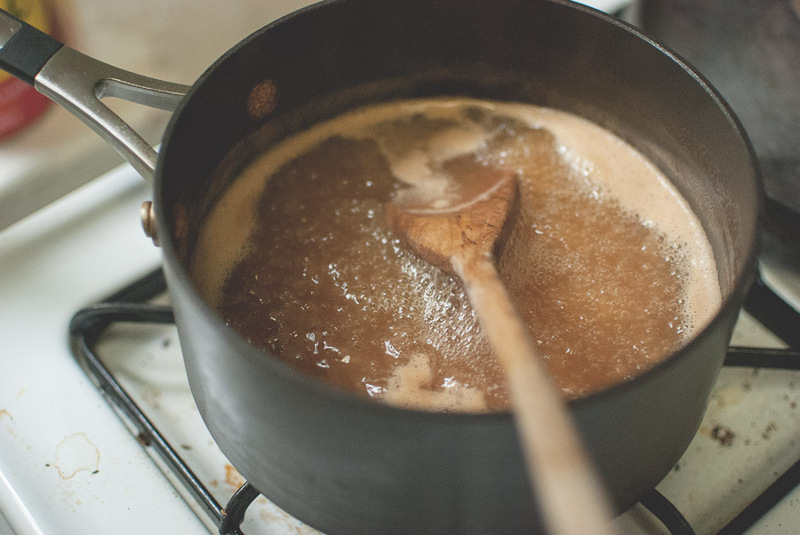 What ended up working for me was to keep the cider at a steady medium boil, and actually measure the liquid to see how far it reduced. 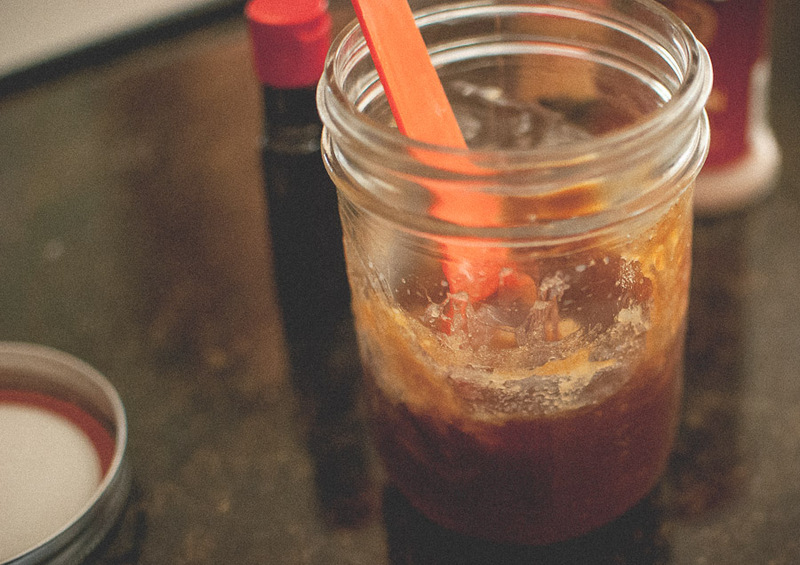 Once it was down to about a cup, it was noticeably thicker, but not as thick as I expect caramel to be. If I cooked it much longer it burned, so at the one cup mark, I put it in a mason jar and stuck it in the fridge. That finally did the trick. 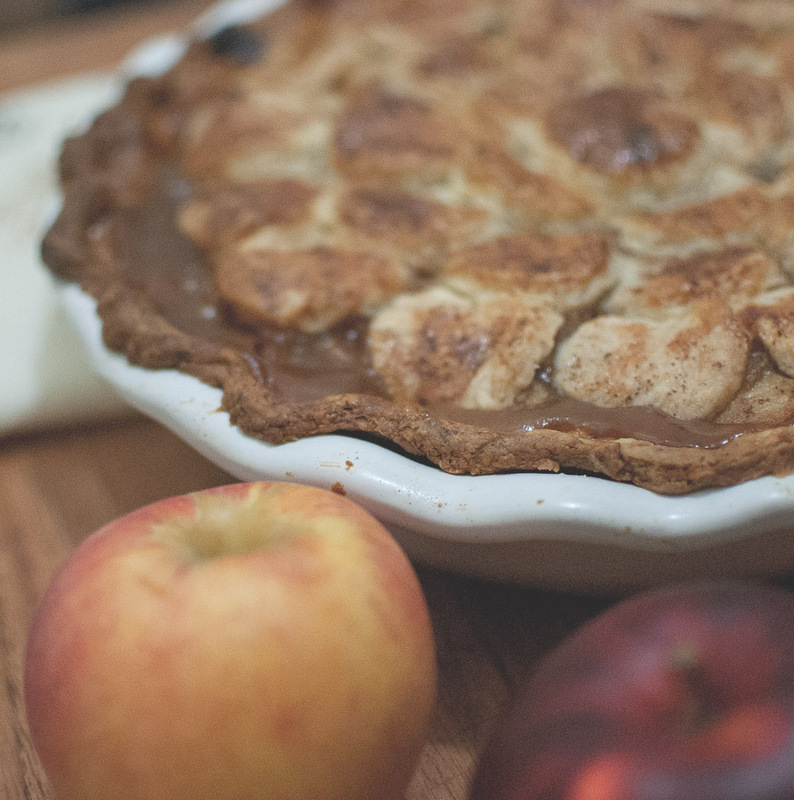 I like the apple pie filling to be perfectly soft and have no sort of undercooked bite to the apple texture. 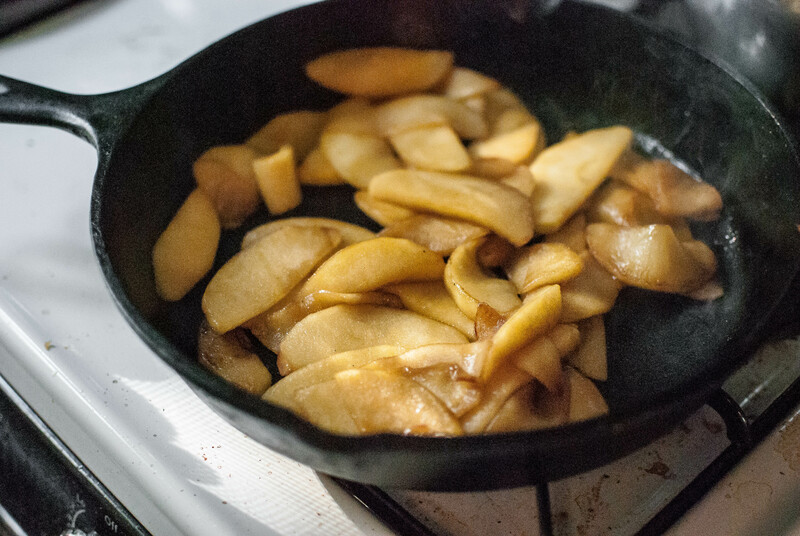 Once I’d cut up the apples, I sauteed them in skillet until they softened. 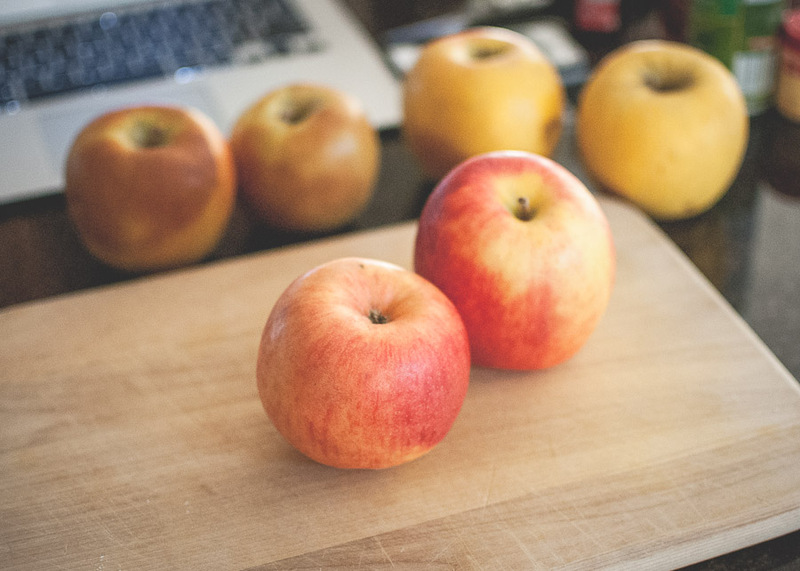 The additional benefit of pre-cooking your apples is that it removes some of the juice and the pie will be less likely to be watery (the pie in the original recipe photos looks very liquidy.) This takes about 10 minutes in my Le Creuset, and about 20 in a regular kitchen skillet. I let them cool in the skillet for about 10 minutes, then mix the other filling ingredients directly into the apples in the skillet. 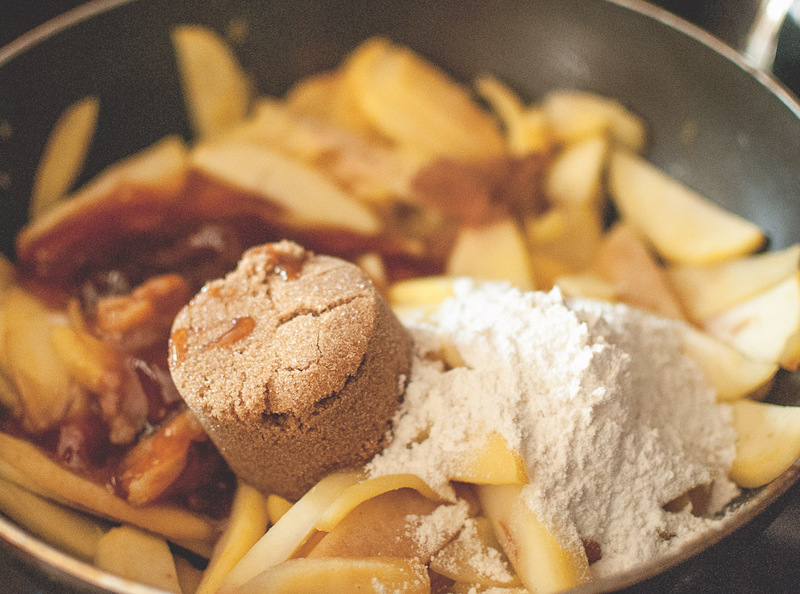 Mix well, then transfer to your prepared pie crust. 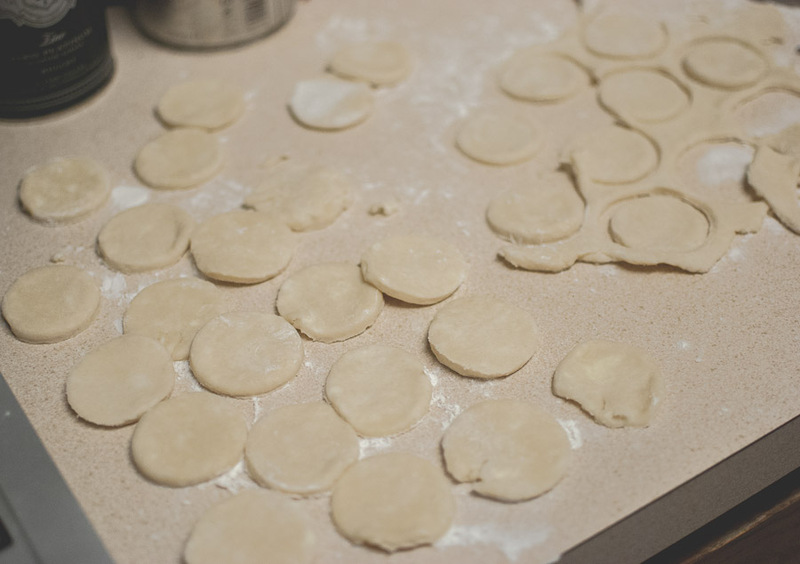 Lately I’ve been wanting to improve my pie crust making skills, so I’ve been toying with these dough circles I saw on Food 52. 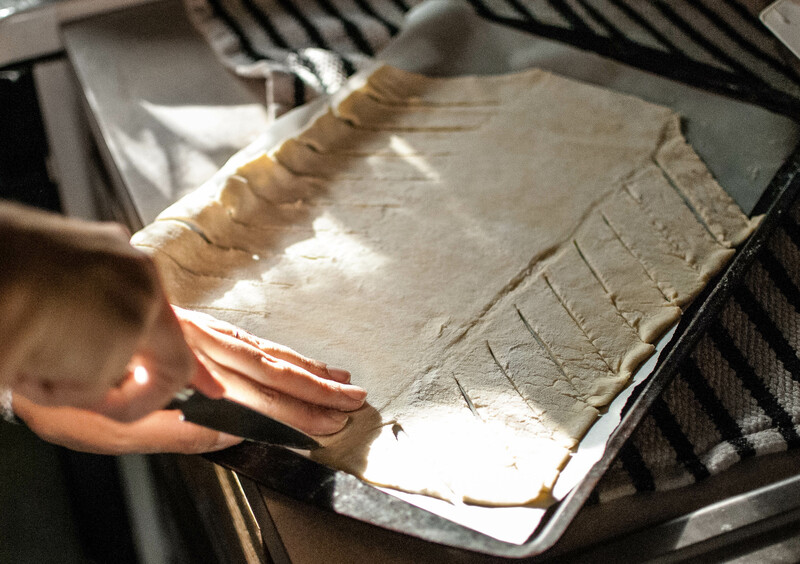 I found that it was important to keep the dough thin and cold, so I rolled the extra crust out on a piece of parchment paper, then transferred the paper and dough onto a sheet pan and refrigerated them for about 15 minutes. 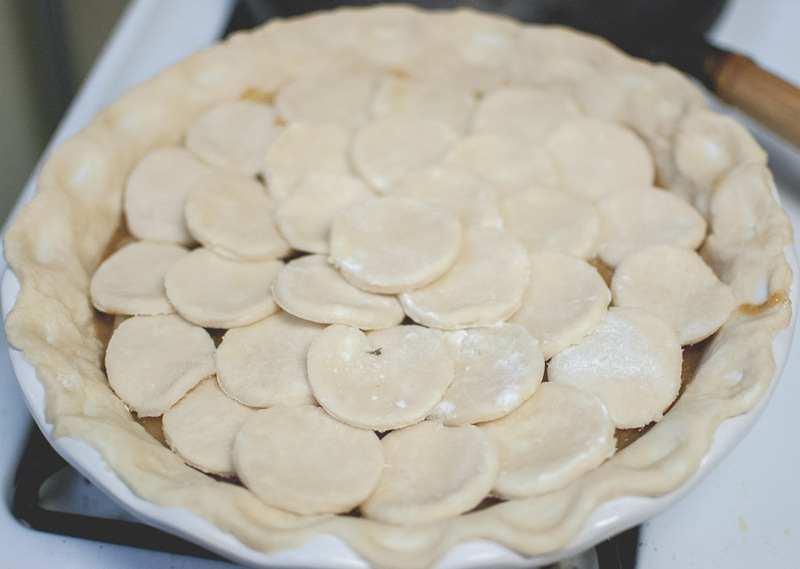 When I was ready to assemble the top crust, I pulled the sheet pan out of the fridge and cut the dough circles with a shot glass. 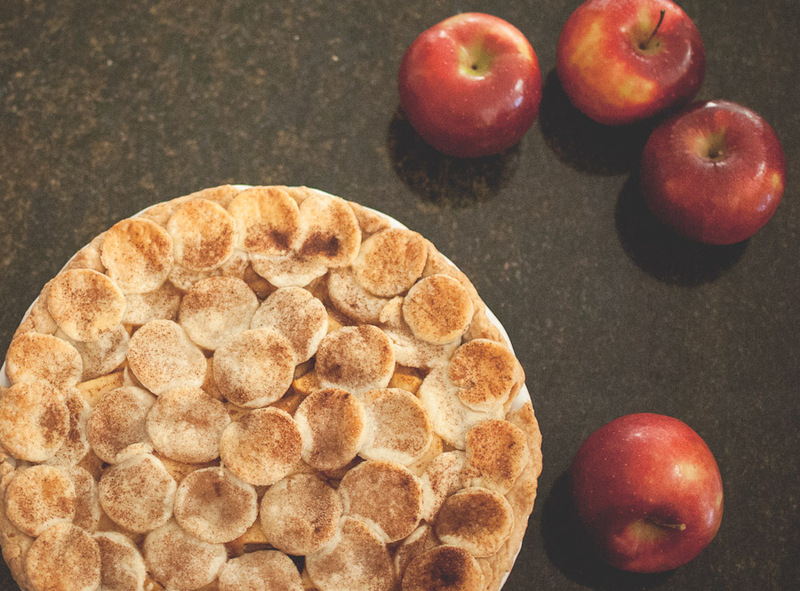 I got the best result by arranging the dough cut-outs in concentric circles over the apple pie filling, then arranging another set of circles along the edge of the crust. Given that I used dough circles instead of a regular top crust, I found the browning on the pie crust to be more even if I brushed it with a little milk, rather than egg. 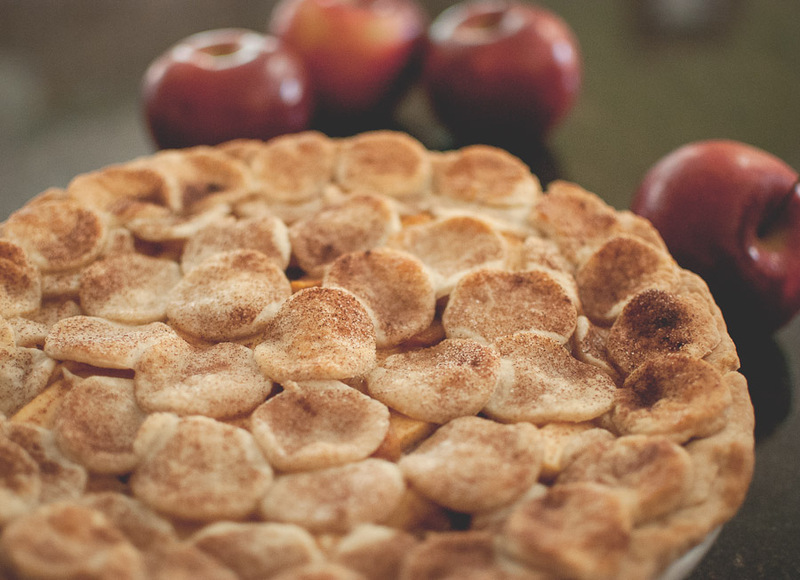 Don’t forget to sprinkle the crust with cinnamon and sugar before popping the pie in the oven. Lastly, as with most pies, it is very important to let the pie cool completely before serving. 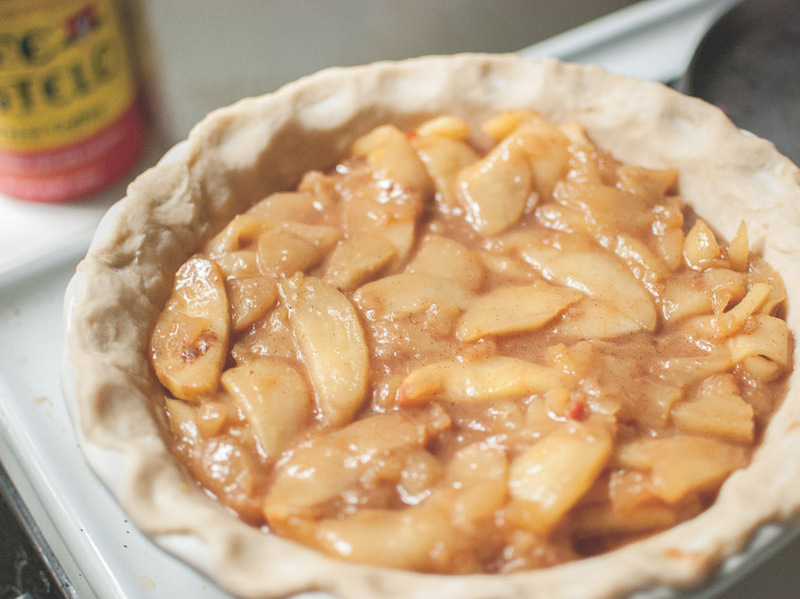 This will help the filling set and not ooze out of your cut pie, as well as help prevent your bottom crust from getting soggy. What I love the most about baking is the precision of the process. 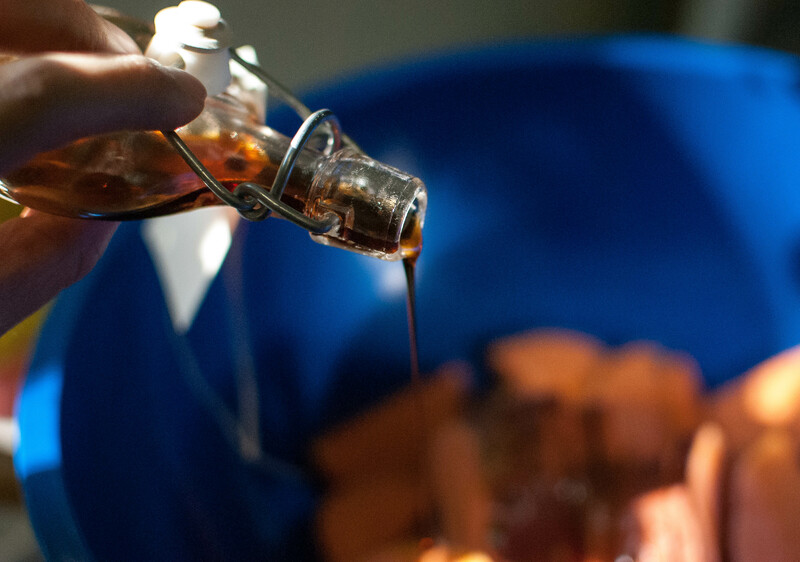 How important it is to measure, to have the right ingredients, to know the temperature of the food or the oven, to understand what happens when you emulsify certain combinations of ingredients. I always feel a little like a scientist in a lab when I’m baking. Every new recipe is like an experiment, and it fun to try again if something fails, because I know, with practice, I can likely fix it. 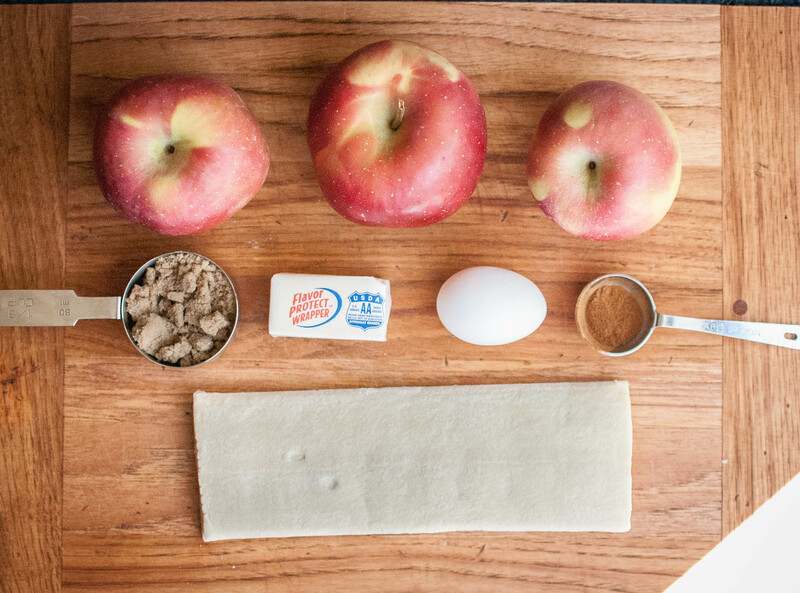 For Thanksgiving next week, I’m in charge of the apple pie. I’ve been working with this recipe I spotted on Cup of Jo over the summer, making just a few adjustments to suit my taste. 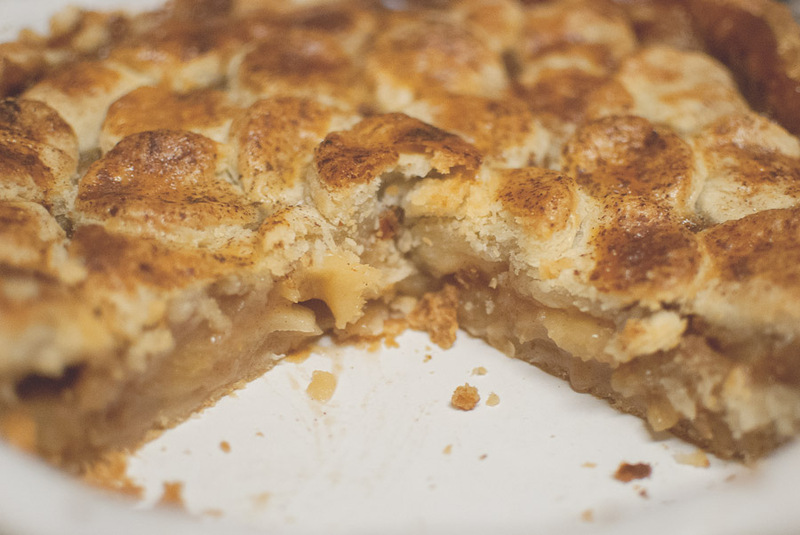 I nailed the bottom crust, the filling, even the apple cider caramel reduction. A beautiful top crust, however, eludes me. This one worked, but I couldn’t help but immediately start calculating how to improve it. I want a thicker ruffled edge and thinner disks that cut more evenly and didn’t shrink away from the edge. 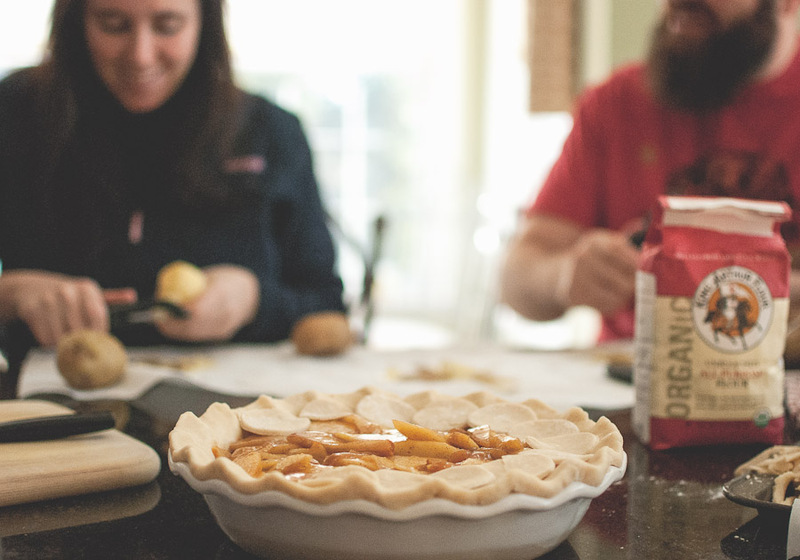 The taste was amazing and we’ve enjoyed it for breakfast over the last few days–I like pie for breakfast more than dessert–but I really want to nail down a beautiful crust. We have a friendsgiving to attend this weekend, so I have another opportunity to practice before the real deal, next week. 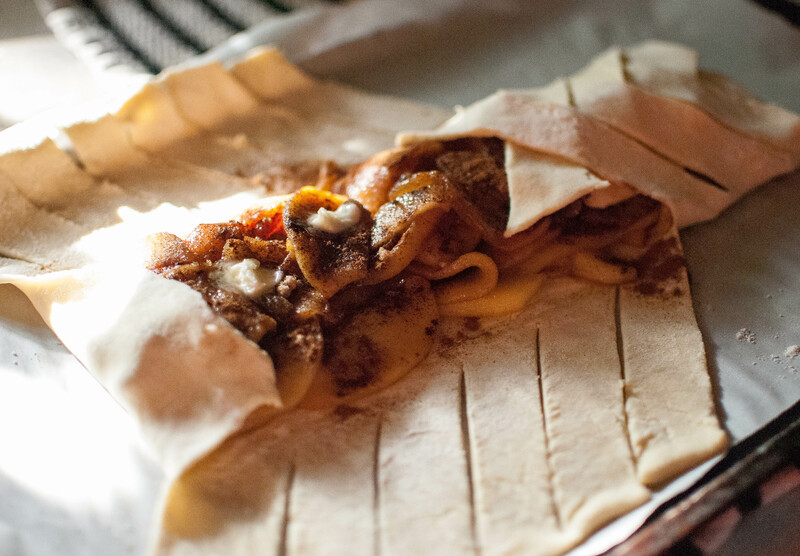 I’ll probably revisit this topic in a few days after I’ve had another go at it, and to talk a bit more about how I changed the crust recipe and the filling. Until then, here’s to practice makes perfect. Some weekends are too lazy for recipes. Coffee, naps, and cuddling are oh so tempting as the days get chillier. 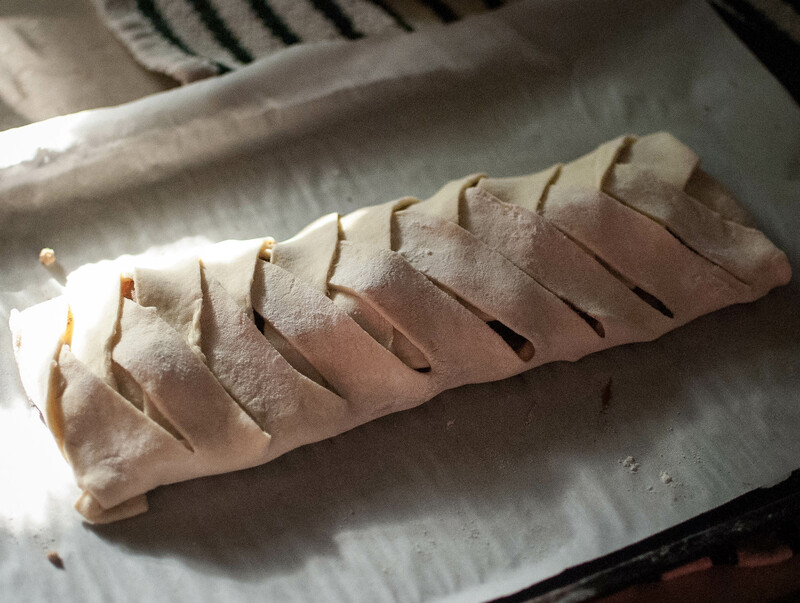 These are the times when its handy to have a few puff pastry sheets tucked away in your freezer. 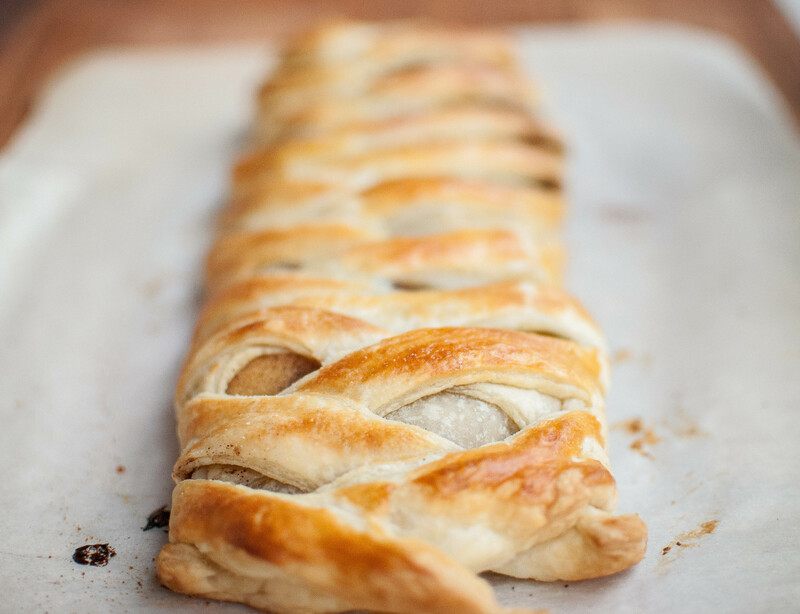 Its so easy to make puff pastry beautiful, and it can be filled with just about anything, savory or sweet. Preheat oven to 400°F. 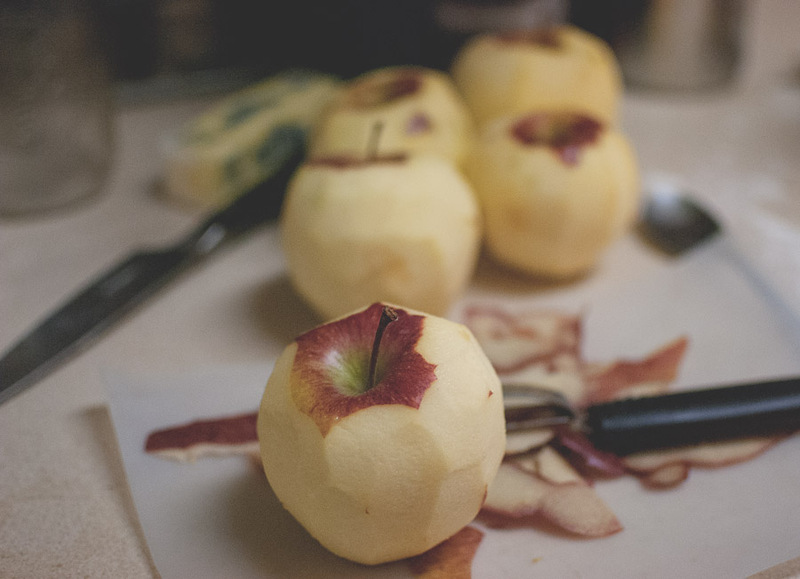 Dividing the apple slices into three batches, sauteing them over medium-low heat in a tablespoon of butter, until soft and golden brown, about 5 minutes. Stir occasionally and add a little extra butter if needed; don’t let them burn. 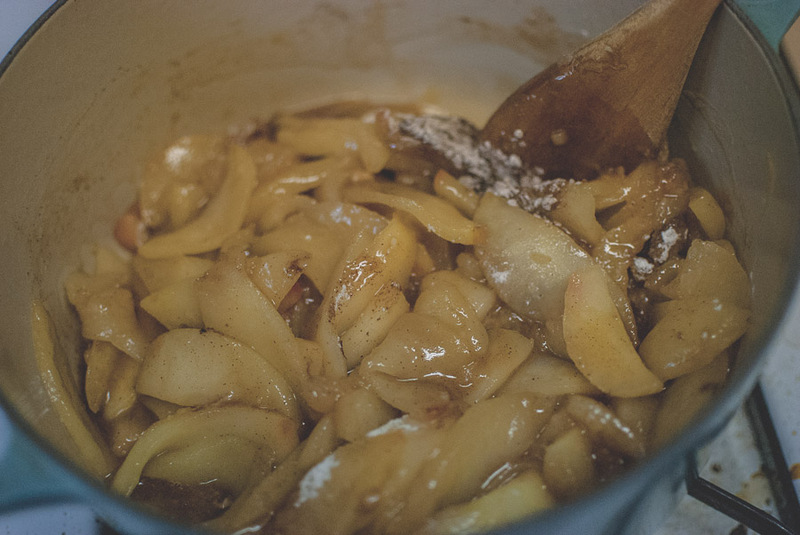 When apples are golden brown, sprinkle them with a teaspoon of brown sugar and cook for another minute, stirring frequently so that the sugar coats all apple slices from all sides. Remove from heat and set aside. Once your puff pastry has defrosted, follow the instructions in the video posted below to roll out and cut your puff pastry. 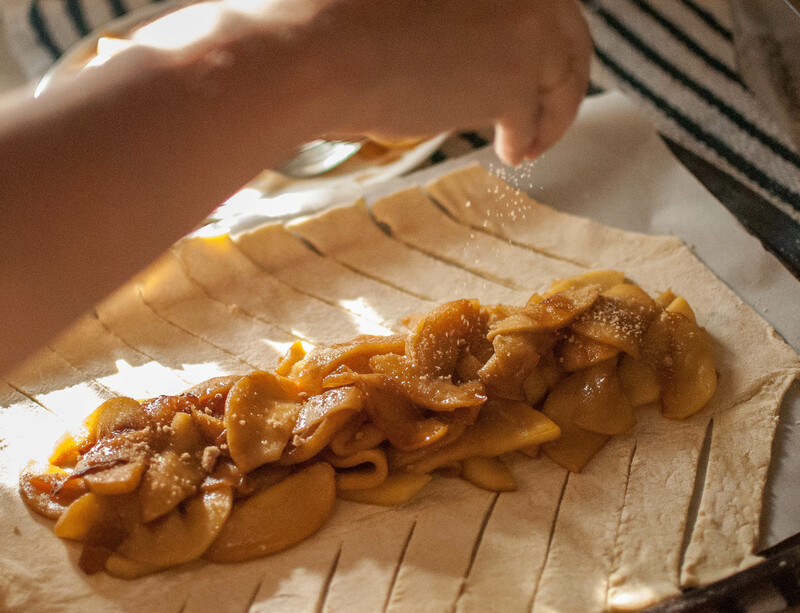 Add the cooked apples to the center of the dough, sprinkle with1 tbsp brown sugar, 1 tsp cinnamon, and 1 tbsp butter cut into four small cubes and even distributed over the apples. 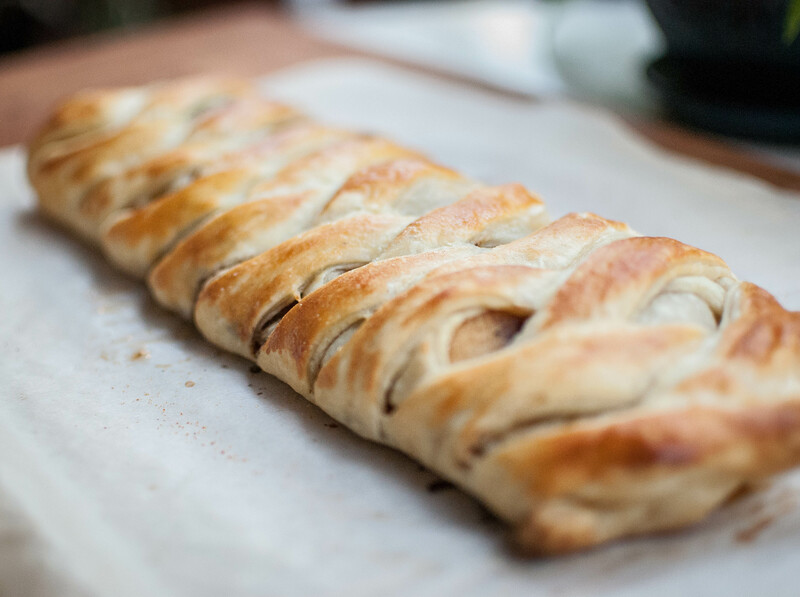 Braid pastry, brush with egg white, and bake for 25-30 minutes or until golden. Allow to cool for 15 minutes before serving. 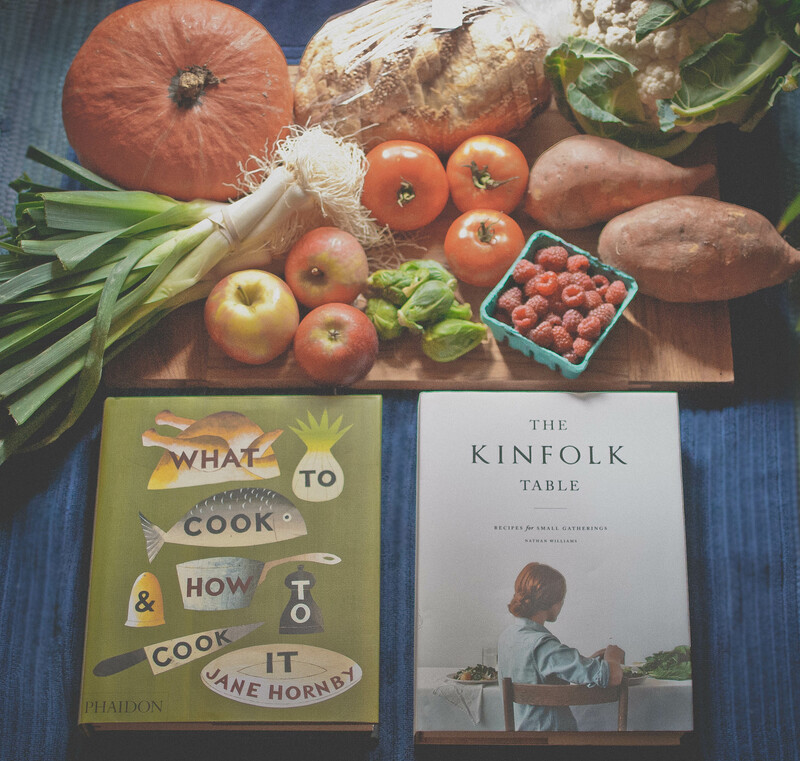 Just in time for the weekend, my copies of The Kinfolk Table and What to Cook and How to Cook It arrived in the mail. At different times over the weekend, The Mister and I could each be found with a mug of tea or coffee, slowly sifting through the pages, bookmarking the ones we wanted to try right away. Both books, while very different in style, are beautifully written and photographed, and full of simple recipes that are right up our alley. For lunch on Sunday, I browsed through the books, looking for something that would work well with what I’d picked up from the market the day before. 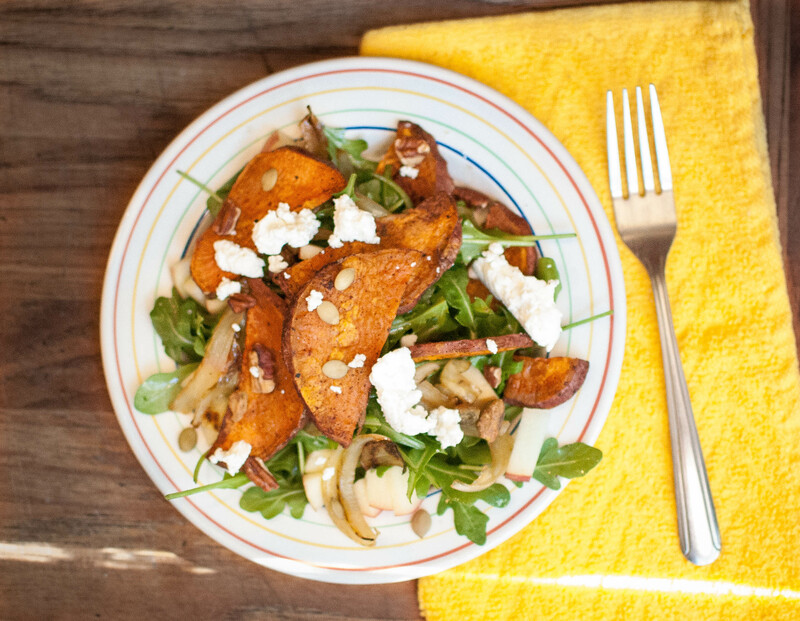 Kinfolk’s Sweet Potato-Apple Salad caught my eye and I decided it would make for a perfect lunch. 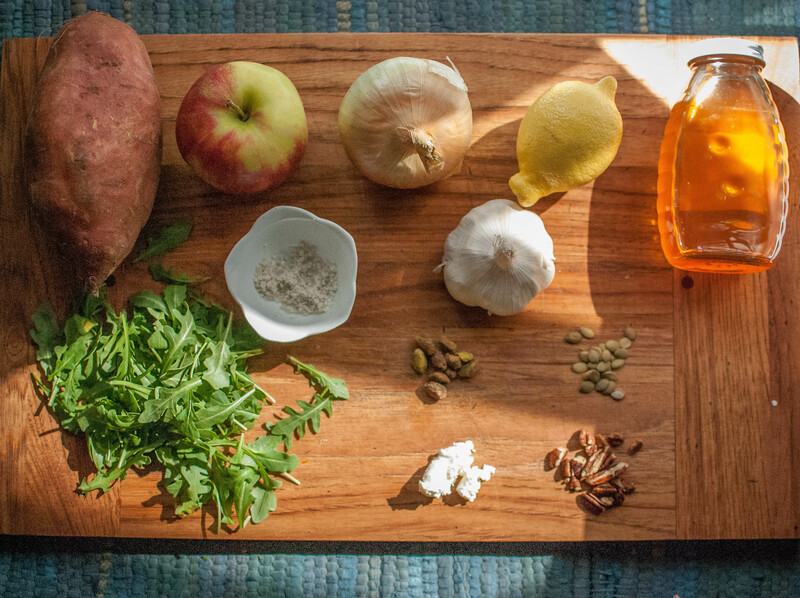 Sweet Potato-Apple Salad adapted from The Kinfolk Table, recipe by Julie Pointer of Portland. Preheat oven to 375°. 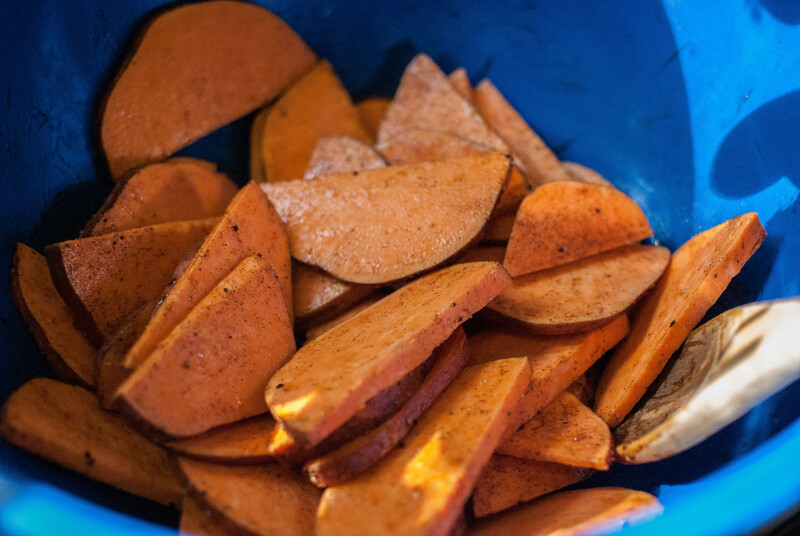 Toss sweet potato slices with 1 tbsp maple syrup, 1-2 tbsp olive oil, salt and pepper. Roast in the oven for 40 minutes, until tender, flipping slices after 20 minutes. Remove from oven and allow to cool for 15-20 minutes. 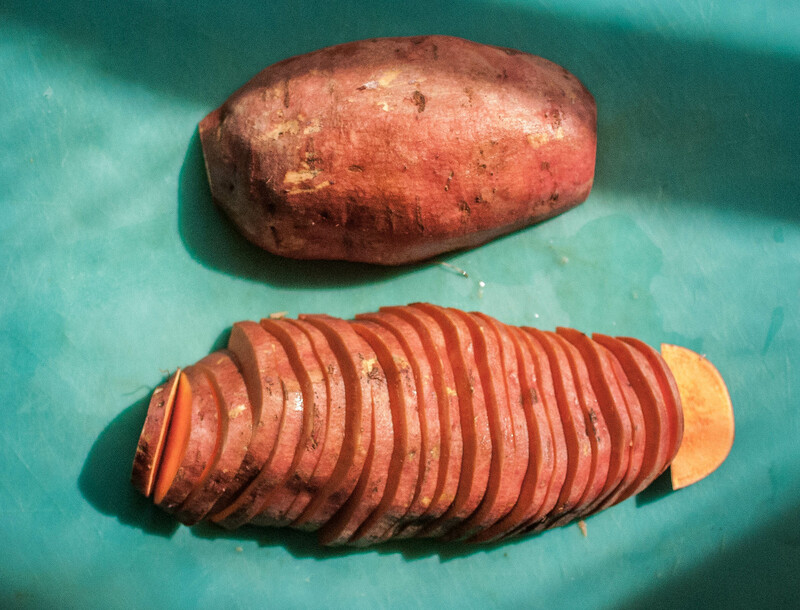 Ten minutes before sweet potatoes are done, saute onion in a little olive oil over medium heat until transparent, then add remaining tablespoon of syrup, stirring for about 5 minutes until onions are lightly caramelized. Allow to cool for 10 minutes. 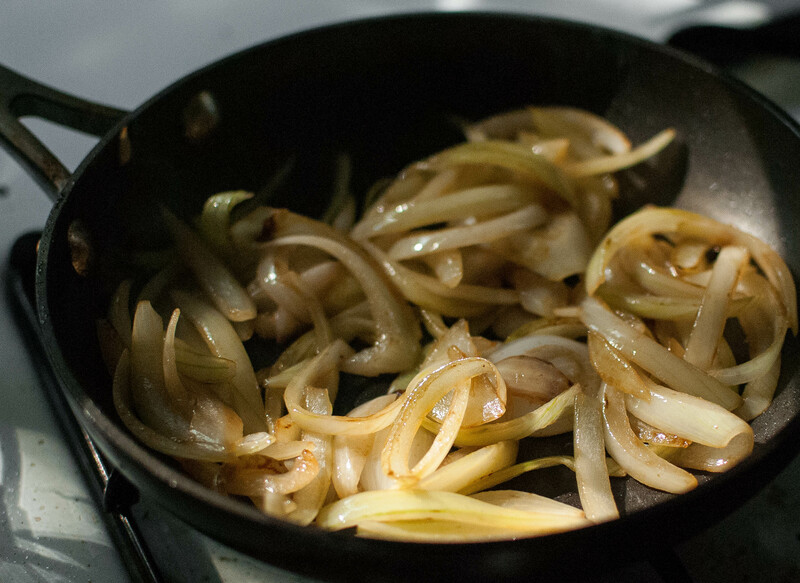 While onions and potatoes are cooling, combine 2 tbsp olive oil, honey, lemon juice, salt and pepper in a small bowl, whisking until emulsified. 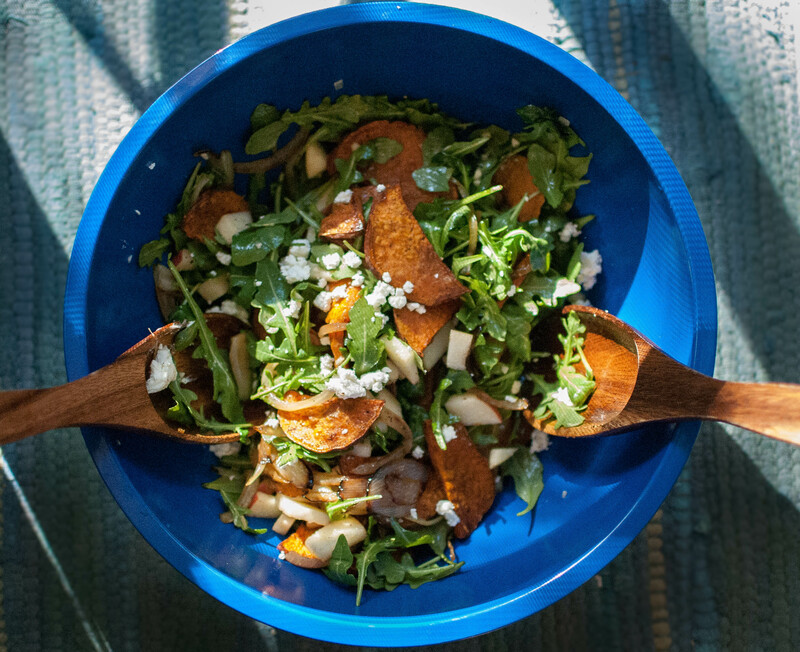 Toss arugula, apple, nuts, sweet potatoes, onions, and dressing in a large bowl. 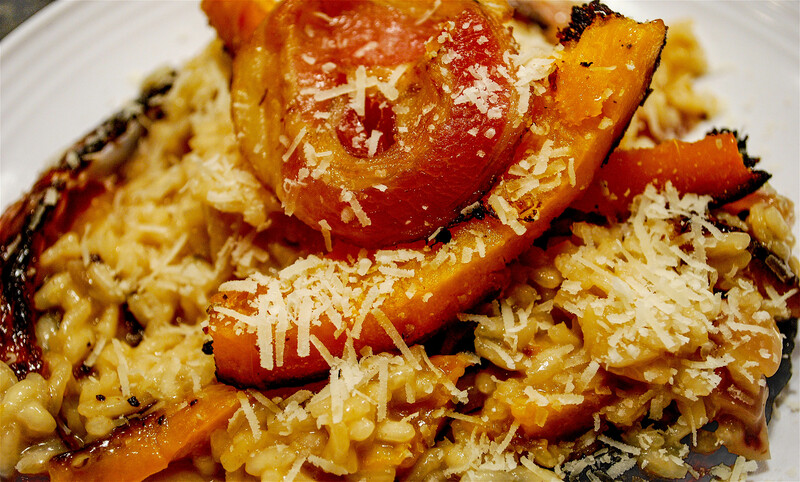 Serve topped with crumbled goat cheese. This salad is fairly simple and leaves a lot of room for improvisation, which is nice when you need to throw a lunch together and don’t have everything called for on hand. 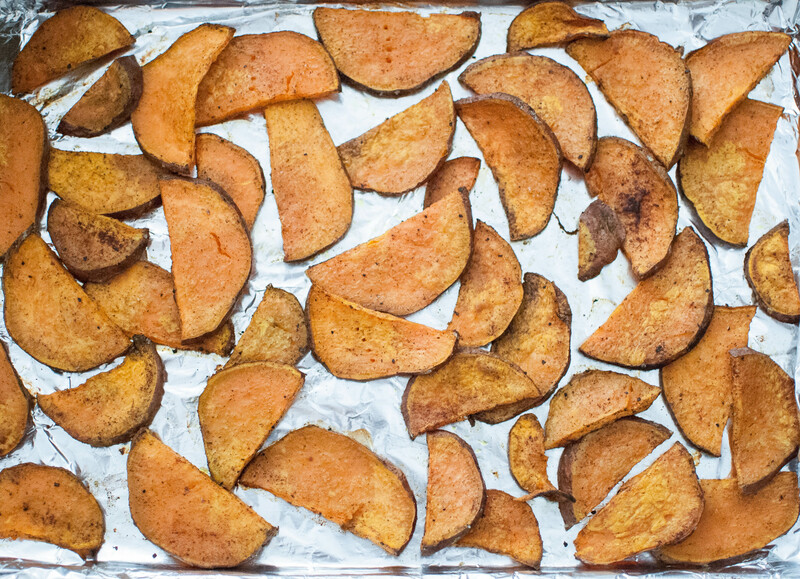 The magic part of this recipe was really in the sweet potatoes. Tossing them with maple syrup and cinnamon, along with the olive oil, really brought out their flavor and it was tempting to munch on them as they cooled instead of saving them for the salad. This recipe makes a healthy lunch for two, but could easily be halved for one or doubled for four. When making your dressing, ditch the whisk, and put your ingredients in a small jar, secure tightly with a lid, then give it a good shaking for about a minute. 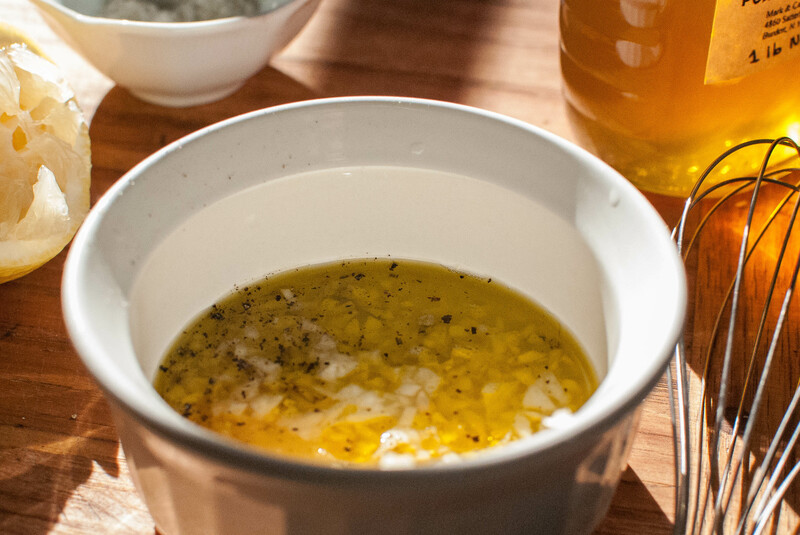 Best emulsification you’ll ever get on a dressing. I find that adding crumbled goat cheese before mixing the salad means I wind up with more goat cheese on the sides of the bowl than in the salad. Consider tossing the dressing and salad first, then after you’ve served, top with the crumbled goat cheese. 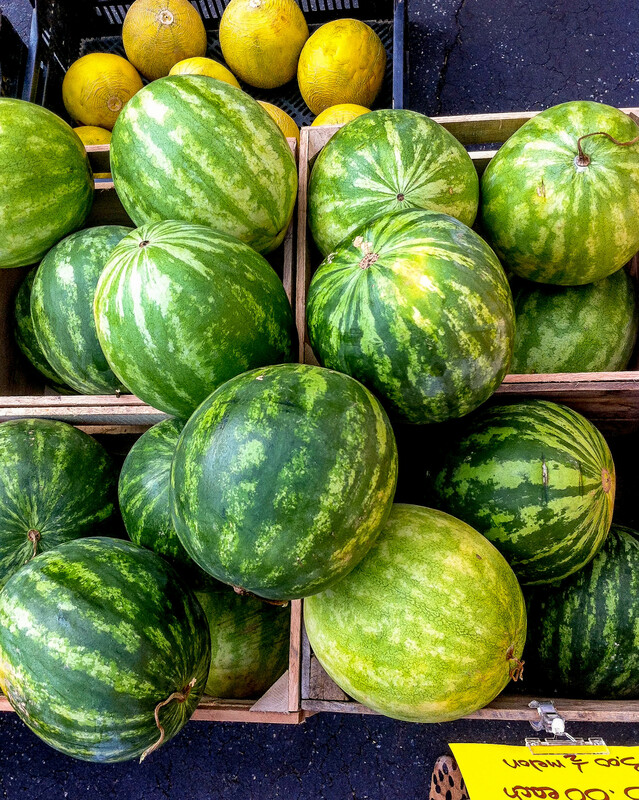 I always get a little sad as the last few weeks of summer produce make their way into the farmer’s market in September. I find myself thinking, “Blueberries won’t taste this good for another year” or “Will this be the last of the summer melons?” And yet, the fall produce appears and I get excited about the amazing things I will get to eat again. 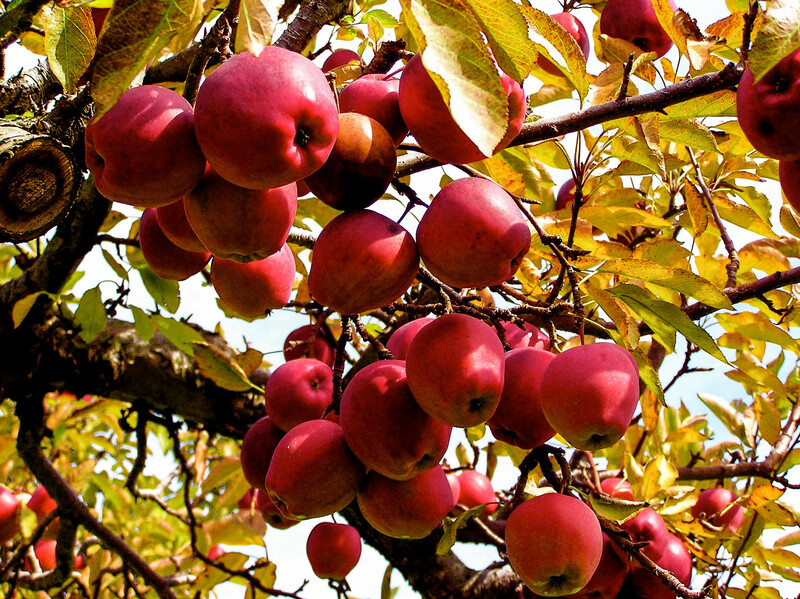 Looking through these photos from recipes tried in years past has me excited for crisp temperatures and fall bounty. These all need to make a reappearance on my table soon, and until then I will be savoring the last days of blackberries and heirloom tomatoes. 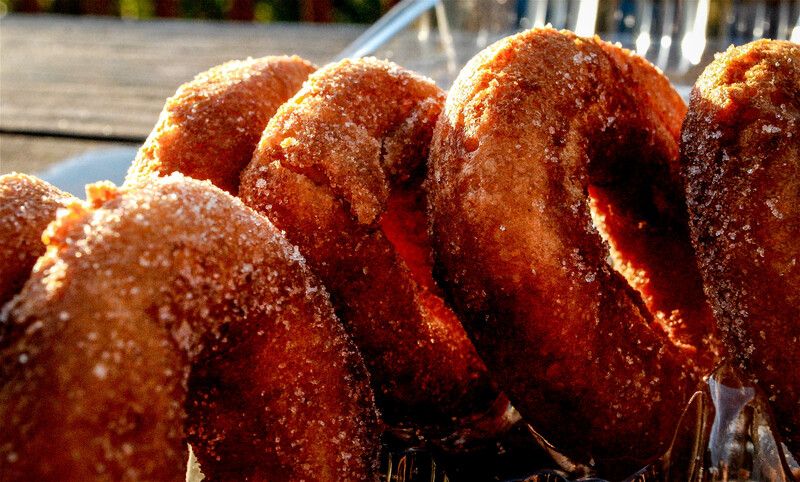 Apple cider donuts are above my skill level but I think they taste best piping hot with apple cider after a couple hours spent picking apples.